“Number one, the main goal coming into this convention was to make sure we left unified,” Governor Andrew Cuomo said on Thursday morning, apparently without a sense of the irony in such a statement. Cuomo, the Democratic governor of New York, continues to be locked in a feud with Bill de Blasio, the Democratic mayor of New York City, which produces a current of disunity running through any and all politics the two are involved with. The conflict follows them everywhere, even to the Democratic National Convention, where each spoke on the main stage without mentioning the other, and can overshadow such speeches, policy announcements, and other events. Even while both were in Philadelphia calling for party unity behind Democratic presidential nominee Hillary Clinton, there is no evidence that either Cuomo or de Blasio is doing anything to bridge their own ongoing divide. Each took pains to compliment Vermont Senator Bernie Sanders on his presidential campaign, attempting to help heal the divide between the Sanders and Clinton camps after a contentious presidential primary. A far different approach than they take with each other. “Governor Cuomo and I and Democrats all across the state of New York are absolutely unified when it comes to Hillary Clinton,” de Blasio told WNYC’s Brigid Bergin during a Tuesday interview at the convention when Bergin pressed him on the unity contradiction. “I don’t think anything is irreconcilable in life,” de Blasio went on to say, as he often does when asked about the frayed relationship. “But I would say there are fundamental, ideological differences. And then I would also say there’s the issue of how the State of New York treats the City of New York,” he added, in a now-familiar refrain. At a Democratic convention, both Cuomo and de Blasio have a lot to boast - combined they’ve made significant progress on LGBT rights, the minimum wage, paid family leave, affordable housing, education, and more top progressive agenda items. Instead of crediting one another, they avoid each other. De Blasio was scheduled to speak at the Thursday morning breakfast event at which Cuomo was talking of party unity. But due to some combination of the length of the program, a lack of communication, the feud, and de Blasio having another event to get to, he left without addressing those gathered. The New York State Democratic Party, controlled by Cuomo, hosted three such breakfasts this week. 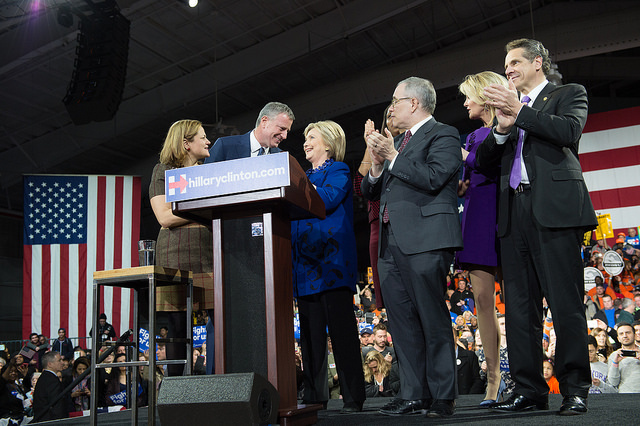 De Blasio attended just the one. There, he heard Cuomo call New York “the progressive capital for the country,” but make no mention of the liberal mayor of the country’s biggest city who has pushed New York politics leftward. “We have really made this progressive agenda a reality,” Cuomo said after laying out accomplishments like marriage equality and a path toward a $15 per hour minimum wage. He made no mention of the pre-kindergarten program that has been de Blasio's biggest accomplishment as Mayor and is supported by state funding. The 2014 fight over funding for pre-K saw some of the earliest seeds of the conflict between Cuomo and de Blasio that has become more intense over time - especially after the mayor publicly lashed out at the governor on June 30, 2015 for undermining the city's interests. The two have clashed over a wide variety of policy issues over the past two-plus years. Spokespeople for Cuomo and de Blasio did not return requests for comment for this story. New York’s top two Democrats, Cuomo and de Blasio, went to Philadelphia ready and able to brag of the progressive accomplishments made back home, but not on speaking terms. They left just as far apart, if not more so. All eyes are on Philadelphia this week as the Democratic National Convention takes place there, Monday through Thursday. 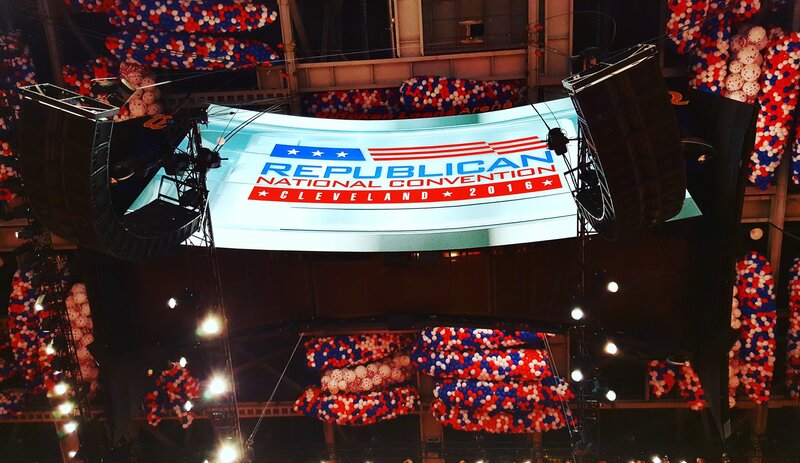 Last week saw the Republican National Convention in Cleveland, where Donald Trump was formally nominated for President, and Mike Pence for Vice President. This week, Hillary Clinton will be officially named the Democrats' presidential nominee, with her recently-announced running mate Tim Kaine for Vice President. Though there was some drama (a minor push by anti-Trump delegates to have a roll call vote; host-state delegates from Ohio showing their displeasure with Trump; the Melania Trump plagiarism uproar; and the Ted Cruz non-endorsement debacle), proceedings went fairly smoothly at the RNC, and things were surprisingly peaceful outside, with some protest, little violence, and relatively few arrests. Trump gave a long, angry acceptance speech on Thursday night, diagnosing and promising to fix America's wounds, and quickly, and to thus "Make America Great Again." Before leaving for Philadelphia, de Blasio will hold a press conference Monday morning with NYPD Commissioner Bill Bratton "to make a law enforcement announcement." It will be at 10:30 a.m. at the 84th Precinct in Brooklyn. Because most prominent New York officials are Democrats and they'll be at the DNC, it will be another fairly quiet week in New York City and around the state in terms of political events - but there are several to be aware of - see our day-by-day rundown of those and DNC proceedings below. On Monday at 10:30 a.m. at John Jay College of Criminal Justice, City Council Members Helen Rosenthal and Inez Dickens and the New York City Economic Development Corporation will host a Request for Proposal (RFP) access workshop; “We are expanding our outreach efforts to make sure that emerging and established developers like you - including M/WBE firms - know about the opportunities at NYCEDC and how to submit an RFP.” A second workshop will be held on Thursday. On Monday at 1 p.m. in Manhattan, the City Planning Commission will host a Review Session meeting. At 8:30 a.m. at the Greene Space at WNYC & WQXR, the Center for an Urban Future will hold a symposium on “the power and potential of women entrepreneurs in New York City.” The forum will feature a keynote speech from Deputy Mayor Alicia Glen and two panel discussions focusing on the challenges women entrepreneurs face in the five boroughs and how to boost their success, specifically in the technology sector. The event will build upon the Center's March 2016 report, "Breaking Through: The Economic Impact of Women Entrepreneurs." The Democratic National Convention continues Tuesday in Philadelphia. 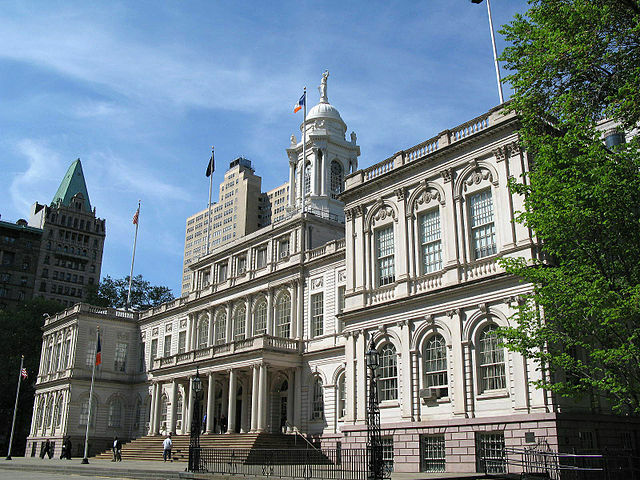 Mid-day, Mayor de Blasio is scheduled to participate in a National League of Cities panel discussion at Philadelphia City Hall. Wednesday at 10 a.m. in Manhattan, the City Planning Commission will host a public meeting. On Wednesday at 6 p.m., the city Panel for Education Policy will hold a public meeting at M.S. 131. The Democratic National Convention continues Wednesday in Philadelphia. On Wednesday afternoon, Mayor de Blasio is scheduled to deliver remarks at a Democratic National Committee Labor Council Panel discussion at the Pennsylvania Convention Center. On Thursday morning in Philadelphia, Mayor de Blasio is scheduled to participate in "City Solutions: Income Inequality" panel discussion. At 8 a.m. Thursday, City and State Reports will host Awards in Sustainability, honoring "outstanding corporate citizens for their work in sustainability - from the construction, energy, transportation and food industries and beyond." The event will feature keynote remarks by Daniel A. Zarrilli, Senior Director of Climate Policy and Programs and Chief Resilience Officer, Office of the Mayor. At 1 p.m. Thursday in Queens, the offices of Queens Borough President Melinda Katz, City Council Members Ferreras-Copeland, Miller, and Richards, and the New York Economic Development Corporation will host a second Request for Proposal (RFP) access workshop. Thursday At 5 p.m in Queens, the Department of Consumer Affairs and Queens Chamber of Commerce will host a seminar for employees on their rights regarding New York City’s Paid Sick Leave and Commuter Benefits Laws. Hillary Clinton will accept the Democratic nomination for President Thursday evening as the Democratic National Convention concludes in Philadelphia. Nothing on the political calendar as of now. New York is heavily Democratic and the state will have a major presence at this week's Democratic National Convention, not least because its delegation will be seated front and center in the Philadelphia arena because the presumptive presidential nominee, Hillary Clinton, calls the Empire State home. It's a similar dynamic, at least in that last regard, to last week's Republican National Convention, where lifelong New Yorker Donald Trump was formally nominated for President. 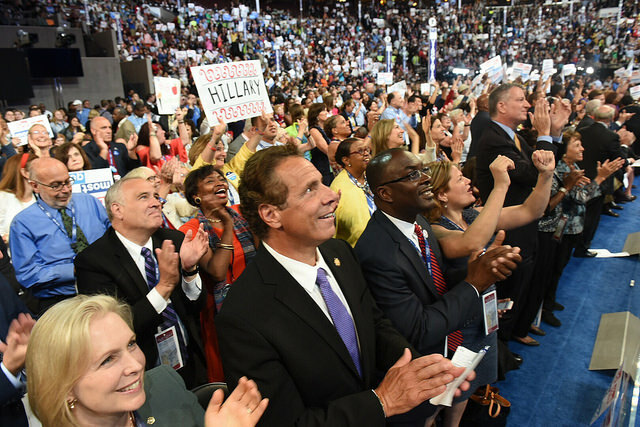 One key difference between the two conventions is that New York's elected officials are overwhelmingly Democrats, so the political star power from the state at the DNC will be greater than it was at the RNC. While former Mayor Rudy Giuliani spoke passionately at the RNC in primetime, current Mayor Bill de Blasio is on the speakers' list for the DNC, though it has not yet been announced when he will speak, and The New York Times reported on Sunday that former Mayor Michael Bloomberg will endorse Clinton during a primte-time speech on Wednesday at the DNC. Bloomberg, a Democrat-turned Republican-turned independent, had announced earlier this year that he was not pursuing an independent run for the White House in part because he didn't want to risk taking votes from Clinton and giving the presidency to Trump. Governor Andrew Cuomo and Senators Chuck Schumer and Kirsten Gillibrand of New York will also speak at the DNC, along with Congressional Reps. Joe Crowley and Nita Lowey. State Senator Adriano Espaillat, who recently won the Democratic primary to replace Charles Rangel in Congress and is expected to easily win the general election, will also speak - Espaillat is poised to become the first person of Dominican descent to join Congress. They lead a large -- 345-member -- New York delegation to Philadelphia that includes other elected officials from Congress to the City Council, party operatives, and others. While the RNC did feature a number of prominent Republicans from across the country like House Speaker Paul Ryan, Senate Majority Leader Mitch McConnell, and Senator Ted Cruz (who was booed by the crowd for refusing to endorse Trump during his remarks), there were many notable Republicans missing, which fit with Trump's reputation as an anti-establishment political outsider. The Bush family was absent, meaning neither former President George H.W. Bush nor former President George W. Bush (nor former Florida Gov. Jeb Bush, who was a main target of Trump during the Republican primary). Neither 2012 Republican nominee Mitt Romney nor 2008 Republican nominee John McCain was present either. Unlike Trump’s convention, Clinton’s will feature a "who’s who" of major party names - Democratic National Convention speakers will include President Barack Obama and First Lady Michelle Obama, Vice President Joe Biden, former President Bill Clinton, Senators Bernie Sanders and Elizabeth Warren, and others. Bloomberg will take clear aim at independents and even some moderate Republicans in explaining his support for Clinton over Trump. One clear theme of the RNC was party unity and while that will be much less of an issue during the DNC, newly leaked emails have led to the resignation of Democratic National Committee head Debbie Wasserman Schultz, who will have a very limited role at the DNC and step down thereafter. The emails showed the DNC favoring Clinton over Sanders during their primary contest. When Sanders speaks Monday night, though, much of the division in the party may be put to rest. Trump's vice presidential running mate Indiana Gov. Mike Pence accepted his nomination and spoke on Wednesday night of the RNC - this week, newly named Democratic vice presidential nominee Virginia Sen. Tim Kaine will do likewise on the third of the four convention nights. As the Republicans did last week, this week the Democrats will adopt their party policy platform. As the DNC kicks off there is much to know and to watch for - read more below. The close of the convention will also set off the final three-and-a-half months of the campaign, leading to Election Day on November 8: the final stretch of speeches, platforms, polls, ads, debates, and more. The Democratic National Convention will take place Monday through Thursday, July 25-28, in Philadelphia, Pennsylvania, at the Wells Fargo Center. Though Brooklyn was seriously considered to host the convention amid a strong push from Mayor Bill de Blasio and others, Philadelphia won the honor. There are three types of delegates for the Democrats: pledged delegates, who petitioned in order to get on the ballot and become a delegate, and are legally bound to support a particular candidate; at-large delegates, chosen by the state Democratic Party, who pledge to vote for a particular candidate; and unpledged delegates, otherwise known as superdelegates, who are prominent party leaders not bound to any candidate. There is no drama expected at the Democratic convention in terms of delegate allocation as Bernie Sanders has conceded and endorsed Hillary Clinton, so the types of delegates are unlikely to be a factor. Sanders supporters are making noise in the streets of Philadelphia already, and are likely to continue doing so all week, inside and outside the convention hall. As more signs were pointing to a Clinton win by a solid margin, she won her home state of New York on April 19. Throughout the race, Clinton accumulated an overwhelming majority of the superdelegates, known party insiders always supportive of her over Sanders, who has not been an establishment Democrat. This led to some of the calls from Sanders and his supporters of a ‘rigged system.’ Leading up to the DNC, the conventions rules committee did vote to keep the superdelegate system in place, but also to study that system and very likely adjust it. Sanders and his supporters, plus the national Democratic tilt leftward, have had a significant influence on the party platform being adopted this year -- progressive influence throughout the primary season as well as recent, more explicit demands. Three issues are emblematic: calling for a $15 per hour minimum wage, standing against capital punishment in all circumstances, and a vision for debt-free college for all students from families earning under $120,000 annually. The party platform has stepped to the ideological left of Clinton, who has spoken in favor of a $12 federal minimum wage (with states going higher per their judgement) and capital punishment for certain crimes. Dr. David Birdsell, a professor and dean at Baruch College, does not believe that Sanders’ endorsement of Clinton is enough to dissipate all of the tension within the Democratic Party - and that was before the recent leak, by Wikileaks, of many Democratic National Committee emails, which show that the committee was indeed biased toward Clinton and against Sanders. DNC Chair Wasserman Schultz will have a very limited role at the convention and has announced she is resigning as chair as of week's end. Sanders will address the convention in prime-time on Monday night, along with First Lady Michelle Obama, and others. Sanders has been saying that his main goal is to make sure that Donald Trump does not become President, and while he has had some kind words for Hillary Clinton, he is likely to focus his remarks more on the dangers that Trump poses to the country and the key issues that he and his supporters have been fighting for. While Sanders and Michelle Obama are the featured Monday evening speakers, Tuesday evening's big name is former President Bill Clinton. But Tuesday evening will also have a very New York-centric feel, with other speakers including students from Eagle Academy; Joe Sweeney, who was an NYPD detective on September 11, 2001; Lauren Manning, a severely wounded survivor of the September 11, 2001 attacks; and the "Mothers of the Movement" - mothers of men killed in police encounters, which will include Eric Garner's mother, Gwen Carr. Wednesday's top speakers will be former Mayor Bloomberg, President Obama and Vice President Biden; and Tim Kaine will accept his VP nomination and speak. On Thursday, Chelsea Clinton and Hillary Clinton will speak. It is not yet clear when Mayor de Blasio, Gov. Cuomo, or Sens. Schumer and Gillibrand will speak. Cuomo has been selected to chair New York state’s delegation at the DNC - a choice that caused Sanders supporters to protest. Other notable New York Democratic superdelegates include former President Bill Clinton, Schumer and Gillibrand, and Mayor de Blasio. While Cuomo and de Blasio are set to speak at the convention, it does not look like the same will be true for City Council Speaker Melissa Mark-Viverito, who has been a frequent Clinton surrogate and campaigner this election season and will be part of the delegation to Philadelphia. Mark-Viverito will be active in Philadelphia this week, including an event on Wednesday afternoon with the Latino Victory Project. She is also expected to be on the campaign trail on Clinton's behalf this fall, especially in states like Florida with large Hispanic populations (Mark-Viverito is Puerto Rican and the first Latina to be Speaker of the City Council).